Sarasota, FL (July 10, 2009) – In the July 2009 issue of Sarasota Magazine, the 2009 FIVE STAR: Best in Client Satisfaction Real Estate Agents (SM) are announced. Nick Herron, the Herron Group/RE/MAX Alliance Group has been selected as FIVE STAR Best in Client Satisfaction Real Estate Agent and this makes the Fifth year in a row that Herron has been selected. Herron has been in the local real estate market since 1989 and specializes in the Sarasota Florida Barrier Islands of Casey Key, Manasota Key, Siesta Key, Island of Venice, Lido and Longboat Key and Sarasota Golf Course and Country Club communities. 80% of Herron’s real estate business is made up of former clients and referrals from those clients. Keep that in mind if you’re considering buying property in Sarasota or on one of Sarasota’s barrier islands. Because nothing says more about him and the level of service he provides and the degree of professionalism he brings to helping you with one of the biggest decisions you’ll ever make. Sarasota Magazine formed a partnership with Crescendo Business Services, an independent research firm, to identify the “best in client satisfaction” real estate agents serving the Sarasota area. This past December, Crescendo surveyed by mail and phone 19,000 Sarasota-area residents who had recently purchased homes. An additional 250 surveys were sent to mortgage and title companies, who are often best able to judge a real estate agent’s technical skills and knowledge. By January, stacks of surveys had arrived and Crescendo began carefully scoring and screening each nominee with the Florida State Real Estate Commission’s database to make certain that licenses were up to date and that no disciplinary actions were pending. Before finalizing the list, nominated agents were reviewed by a blue ribbon panel of local industry experts. This year’s list of “FIVE STAR: Best in Client Satisfaction” real estate agents represents less than 7 percent of actively licensed real estate agents in the Sarasota area. 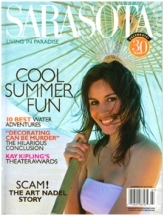 We hope this list serves as a referral network for the 78,000 readers of Sarasota Magazine. Is this list exhaustive? Of course not. There are undoubtedly many other excellent real estate agents that are not on the list this year, but don’t be surprised to see them next year. The 2009 FIVE STAR Real Estate Agents do not pay a fee to be included in the research or the final list of FIVE STAR: Best in Client Satisfaction Real Estate Agents. The inclusion of a real estate agent on the FIVE STAR Real Estate Agent list should not be construed as an endorsement of the real estate agent by Crescendo Business Services or Sarasota Magazine.